The Cross Country Relays are held at Berry Hill Park, Mansfield. View a Google Map here or see the park marked ‘F’ on the map below. The Saucony English Cross Country Relays goes ahead once again at Berry Hill Park. This is the 28th year we have been at this venue and the ECCA thanks you for your entry and we hope you have a good day. 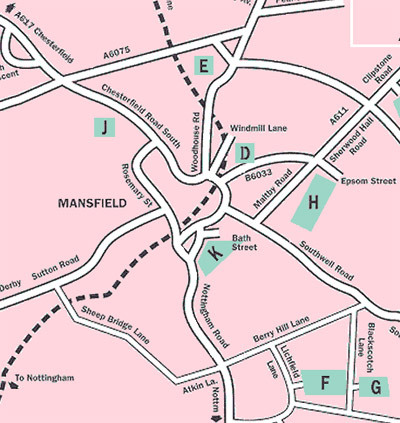 If travelling from the South of Mansfield use junction 27 of the M1 and then follow the A611 for Mansfield. At the end of this road at the traffic lights by the College turn right into Nottingham Rd and then left into Lichfield Lane and head for the Park. From the North come off the M1 at junction 28, and then use the A38 and head towards the Town Centre. At the Sir John Cockle pub, turn right at the traffic lights and head towards Berry Hill Park along Sheepbridge Lane, Atkin Lane and Berry Hill Lane. If travelling via the A1 from the Newark direction get on to the A617, the Southwell Rd, turn left at the Oak Tree pub and then into Berry Hill Lane. When approaching Berry Hill Park look out for signage directing you to parking in the Park. Once again we have arranged free parking, please park and drive responsibly in the Park. Coaches will be directed to Blackscotch Lane where parking will be allowed opposite the Park. If using a Sat Nav then the following post codes will be needed. This is the post code of the house immediately opposite to the main entrance gate to the park on Lichfield Lane. This is the post code of Berry Hill School which is immediately adjacent to the park gate entrance on Blackscotch Lane – near to the far end of the course at the other end of the park.